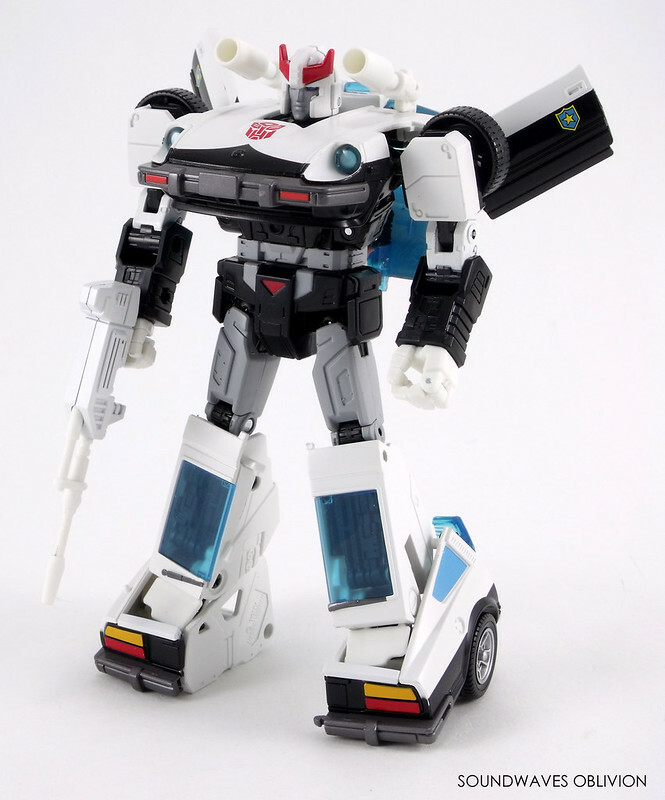 Released at the end of September 2018, MP-17+ is a repaint of MP-17 Prowl from 2013. The figure does not feature any remoulded parts but has been repainted in matt colours replicating his appearance from the original cartoon series. As a result the vehicle mode looks a lot plainer without the "Highway Patrol" lettering however the new clear blue windows and larger Autobot / Cybertron insignia stand out instead. 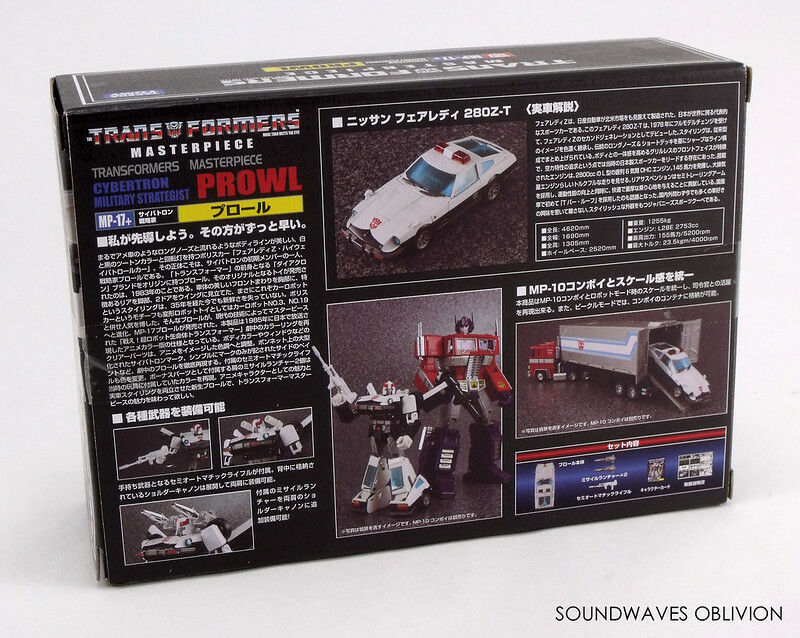 Prowl comes with 2 missile launchers which are repaints of the exclusive missile launchers which came with MP-17 and MP-18 when ordered from Amazon.co.jp. 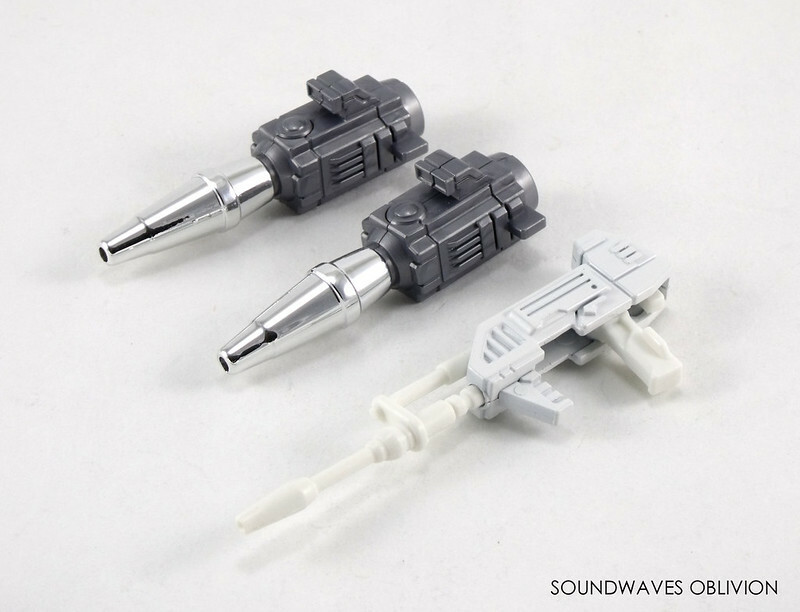 The missile launchers have been repainted grey to resemble G1 Prowl's original accessories. 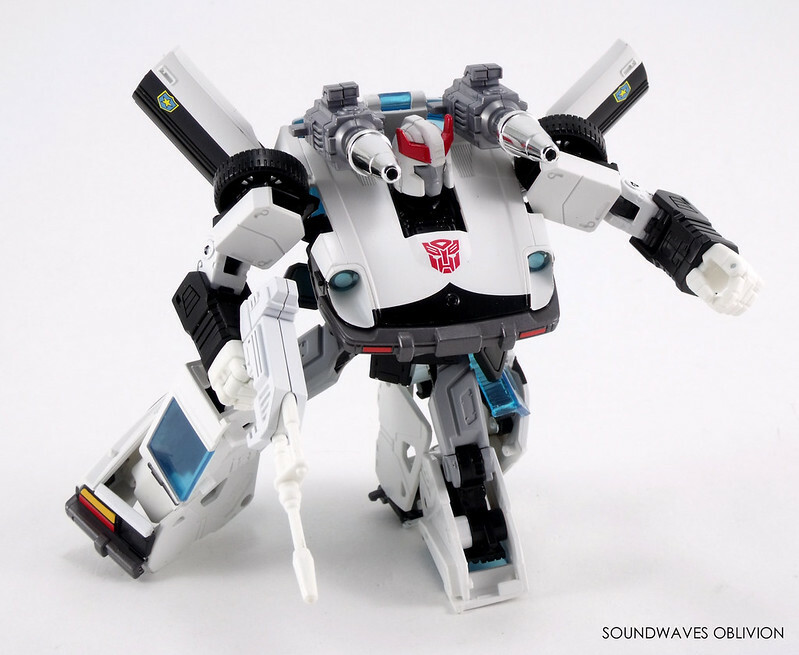 In robot mode Prowl's colour scheme closely follows the animation model, some of the features such as the feet can't resemble the animated model without redesigning Prowl from scratch. Overall the MP-17+ does pull off the animated look. On a separate note, when comparing the Marvel Comics character design you can see where the Sunbow animators got their inspiration from as they look near identical. 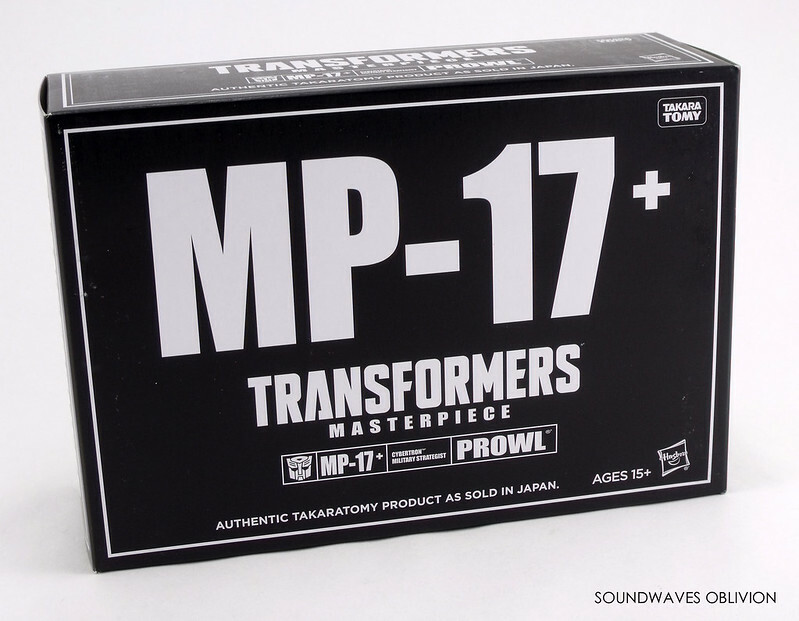 Not counting the Movie Masterpiece figure, Hasbro have not released a Masterpiece figure since 2017 (MP-10 Optimus Prime) more than likely due to the closure of Toys R Us, however that is changing starting with MP-17+ Prowl. 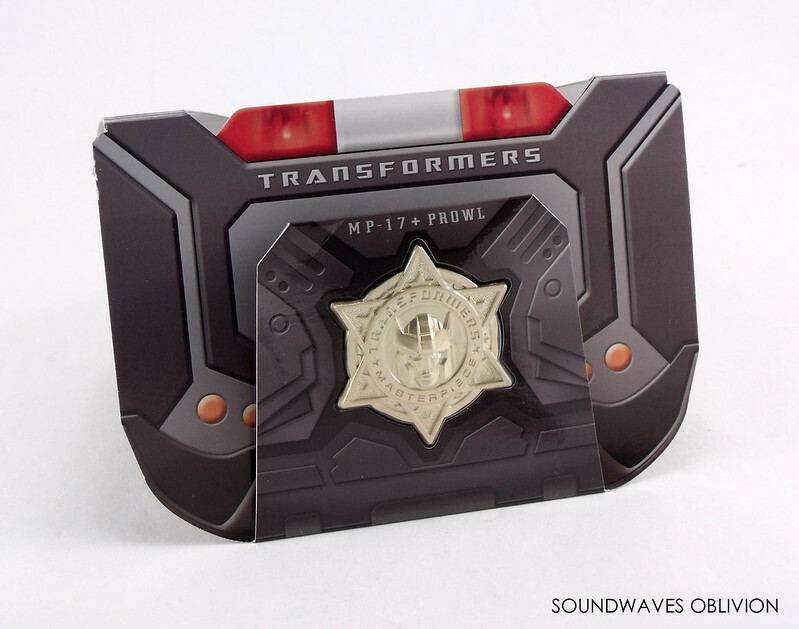 Rather than go through the expense of new packaging and slightly altering the figure, Hasbro directly released Takara Tomy's version of MP-17+. 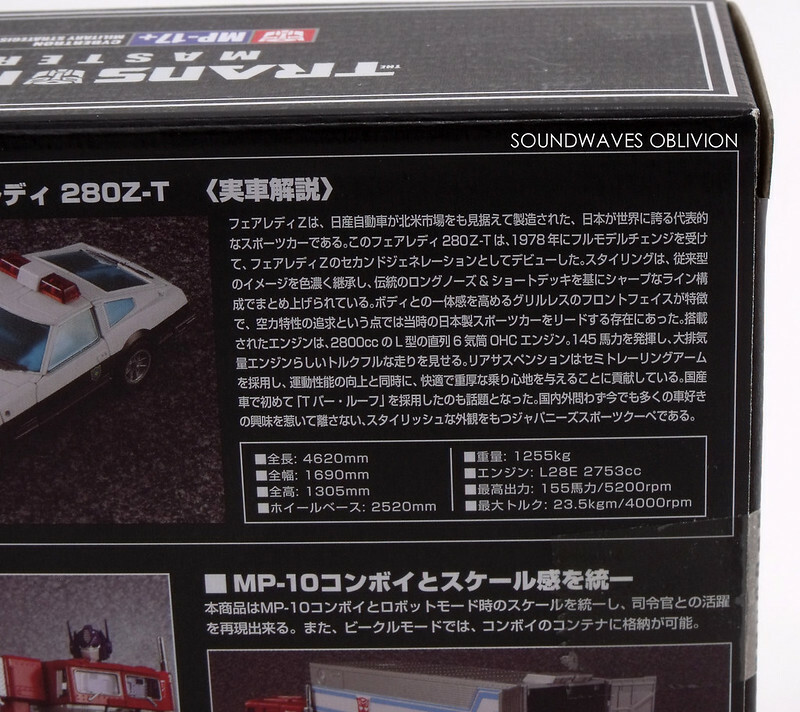 The only difference is that it comes in a plain black box with white lettering stating it is a Japanese import. 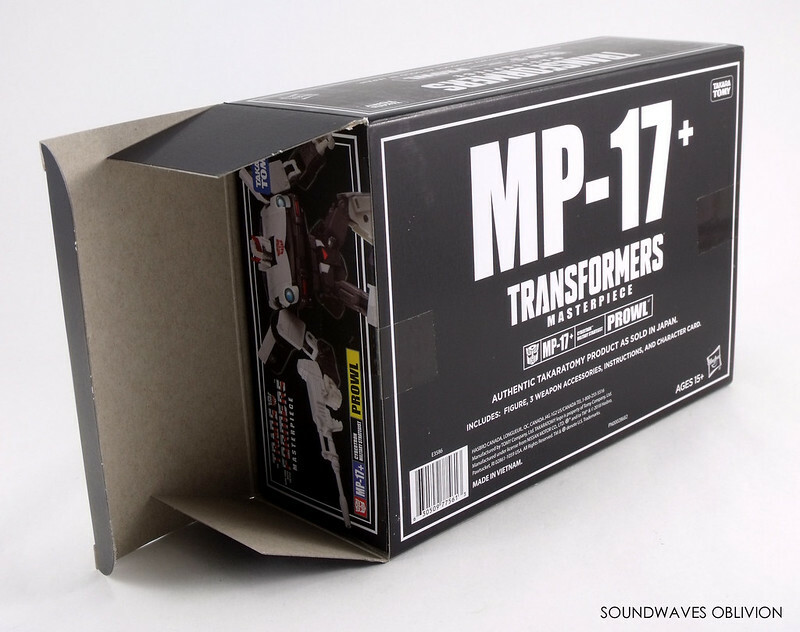 Inside this box is the standard MP-17+ box which is identical to the Takara Tomy release. 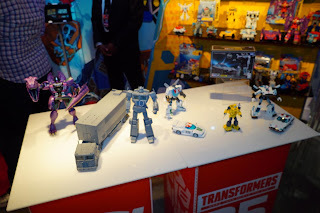 MP-43 Megatron (Beast Wars), MP-44 Convoy, MP-45 Bumble and MP-20+ Wheeljack all appeared at the 2019 New York Toy fair so these releases may follow Prowl. MP-44 Optimus Prime itself will be imported by Hasbro in November 2019 and currently has a price tag of $439.99 USD; which although expensive MP-44 retails at 54,000 Yen which is currently the equivalent of $484 USD. 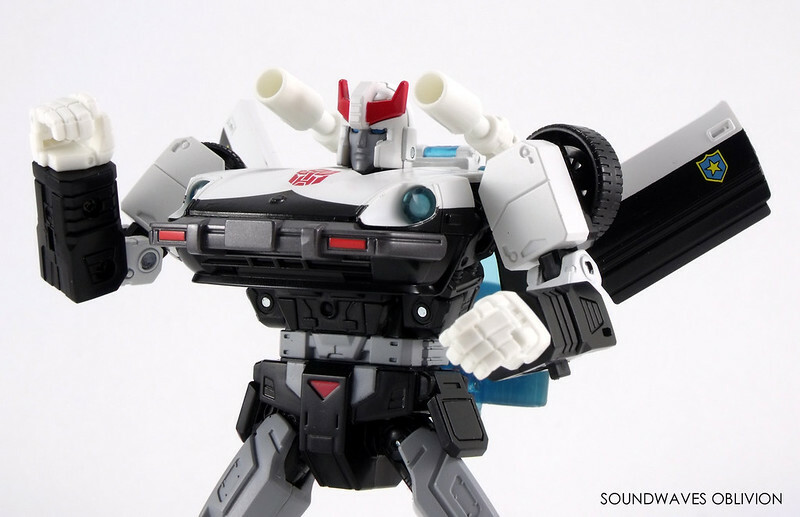 MP-17+ is well worth picking up especially if you are a fan of the animated look. Quality wise it is not as good as the original but the mould has been used many times now, the only thing affected on my copy is that the figure can't grip the hand gun very well the joints however are incredibly tight. "Let me lead. It will be quicker." 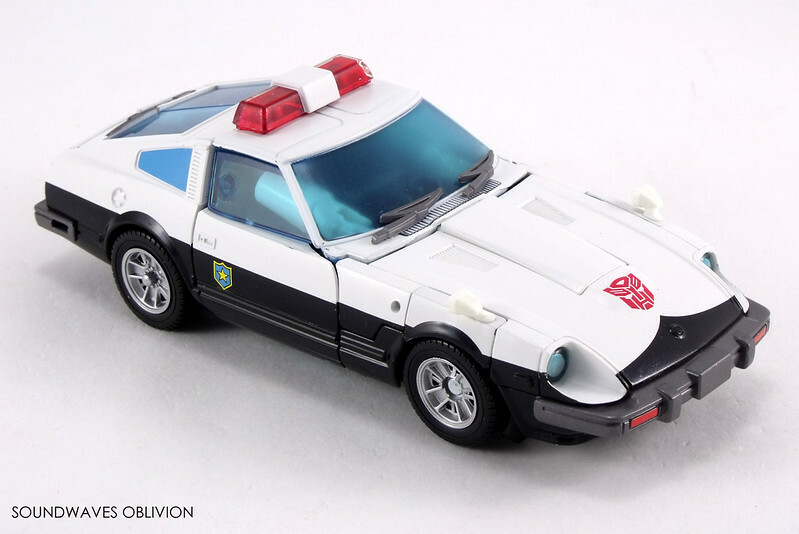 The “Fairlady Z Highway Patrol Car” looks like an American car with its long nose and flowing body line, it is a police car with a black and white two tone colour with rotating light. 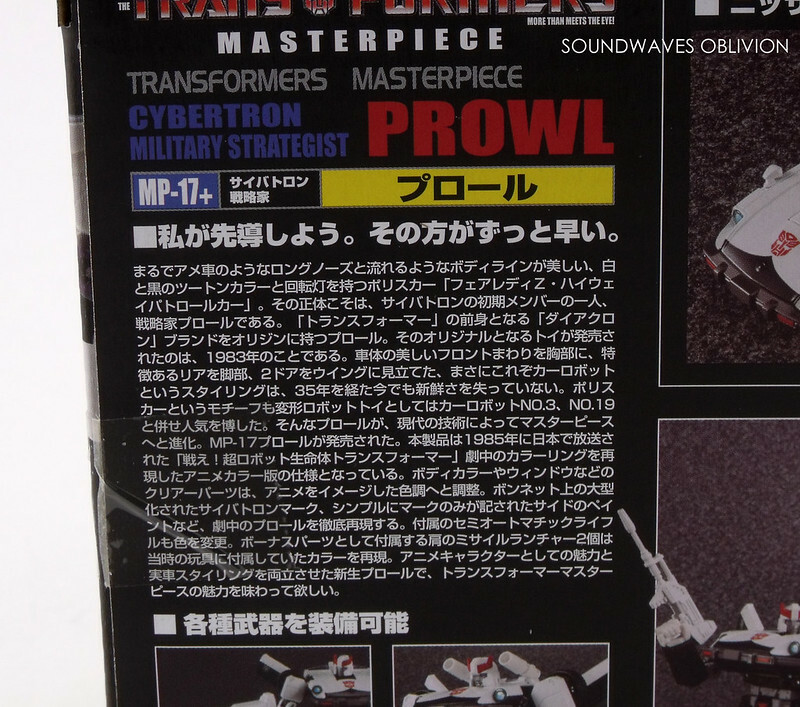 His real identity is one of the core Cybertrons, Strategist Prowl. 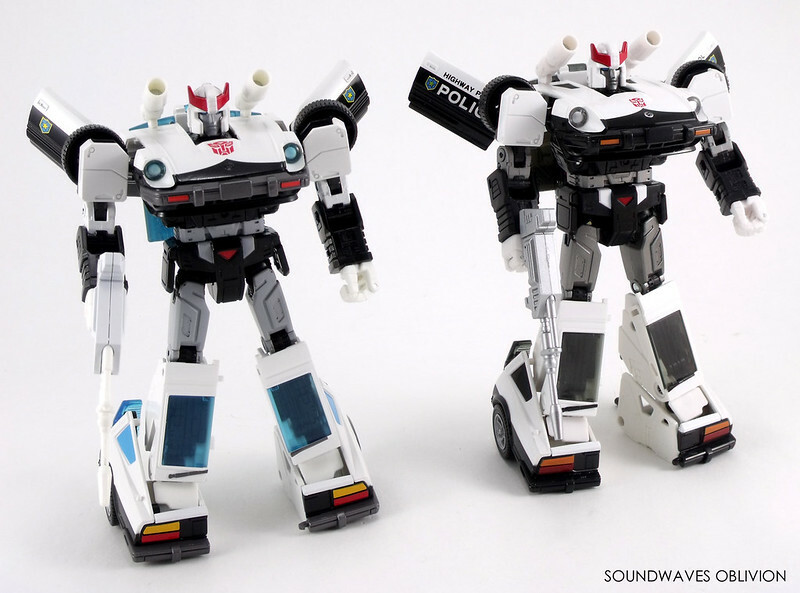 Prowl originated in the “Diaclone” toy line which preceded the “Transformers”; the original toy was released in 1983. The styling of robot mode is still fresh after 35 years; the car body begins around Prowls chest and the characteristic rear of the car form the legs, his 2 doors look like wings. 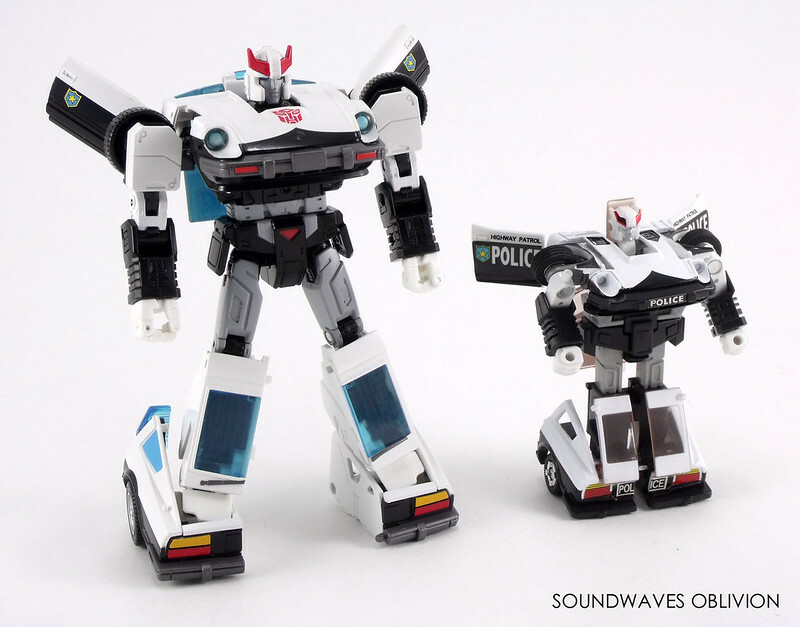 The police theme was popular for a robot toy with other releases in the Car Robot series, NO.3 and NO.19. 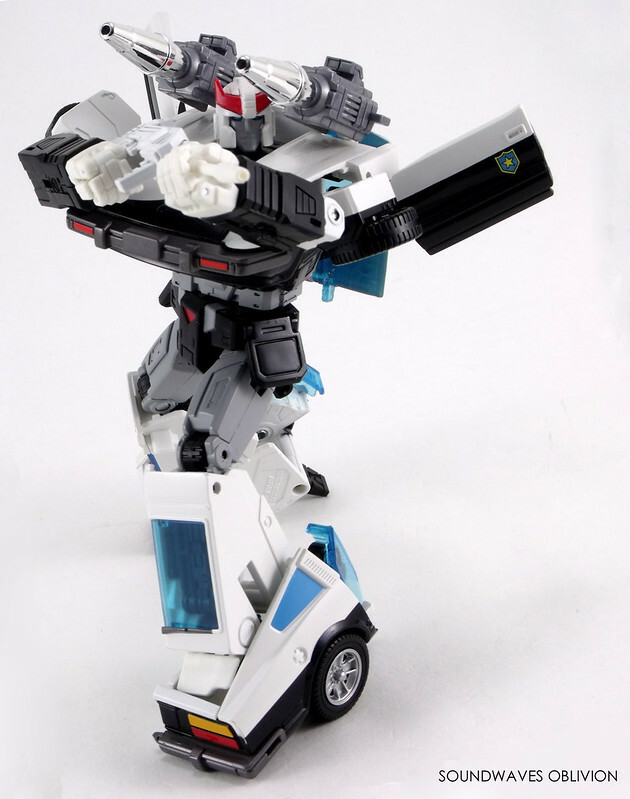 With the use of modern technology Prowl has been turned into a Masterpiece and MP-17 Prowl was released. This particular animated colour version reproduces his appearance from the cartoon “Fight! Super Robot Lifeform Transformers” first broadcast in Japan in 1985. His body colour and windows now match the tone of colour from the animation. 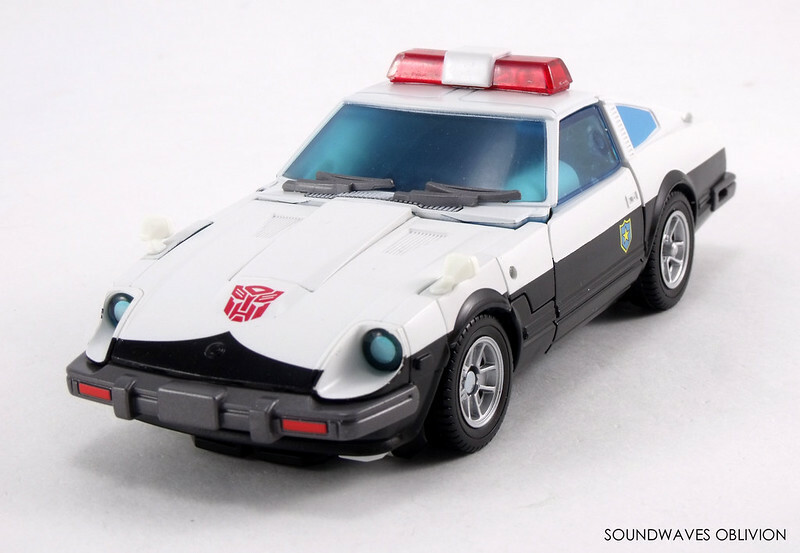 As a finishing touch to reproduce the animated look a large Cybertron insignia adorns the cars bonnet / hood and only the simple shield image appears on the side of the car. His Semi-Automatic Rifle accessory has also changed colour. As a bonus he comes with 2 missile launchers as which have been coloured the same as the original toy. 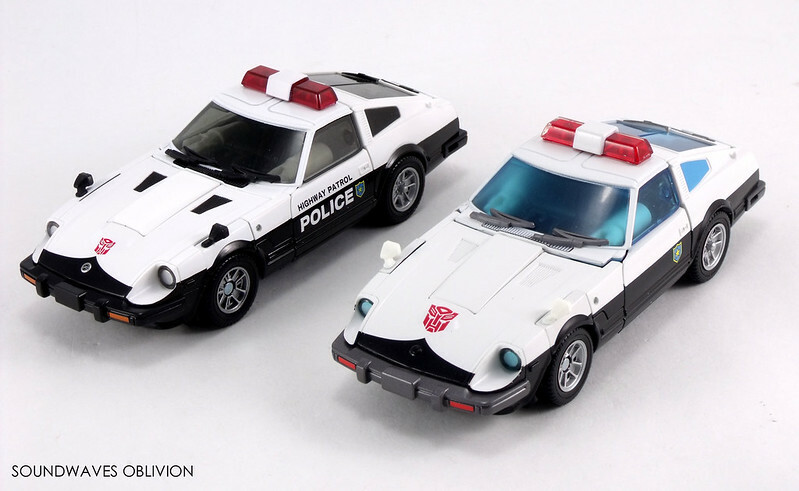 This new Prowl combines the real vehicle styling along side the charm of the animation inspired robot mode; we hope you enjoy the charm of this Transformer Masterpiece. The Fairlady Z was built with a view to capture the North American market, a sports car of which Japan is proud. The Fairlady Z 280Z received an overhaul and debuted in 1978 as the second generation of Fairlady Z. Its overall style has inherited the traditional image of the long nose and short deck with a sharp edged look. The front face of the grill enhances the integration with the car body and its aerodynamic characteristics made this a leading sports car in Japan at the time. The engine is a 2800cc L type straight cylinder with an overhead camshaft. Delivering 145 horsepower it is almost like driving a car with a much larger engine. Its rear suspension uses a semi-trailing arm which improves performance and comfort. This became the first domestic car to adopt the “T-bar roof”. A Japanese sports coupe which has attracted the interest of many car lovers both domestically and overseas. Gloriously styled in the image of a United States highway patrol vehicle. 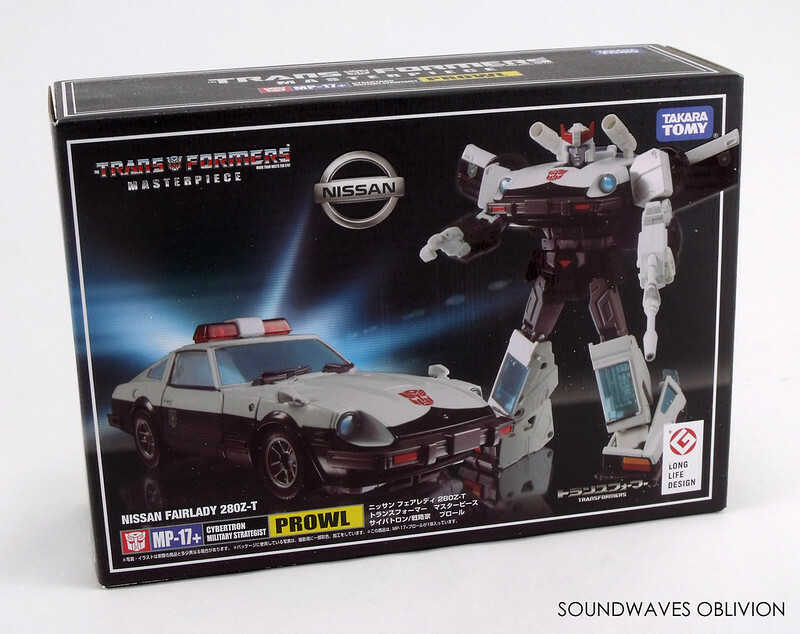 Prowl’s vehicle mode is the Nissan Fairlady 280Z-T Patrol Car. Even in the animated cartoon the shield emblem with the stars remain on the doors but the lettering was omitted, however this helps the two tone colour scheme to stand out. 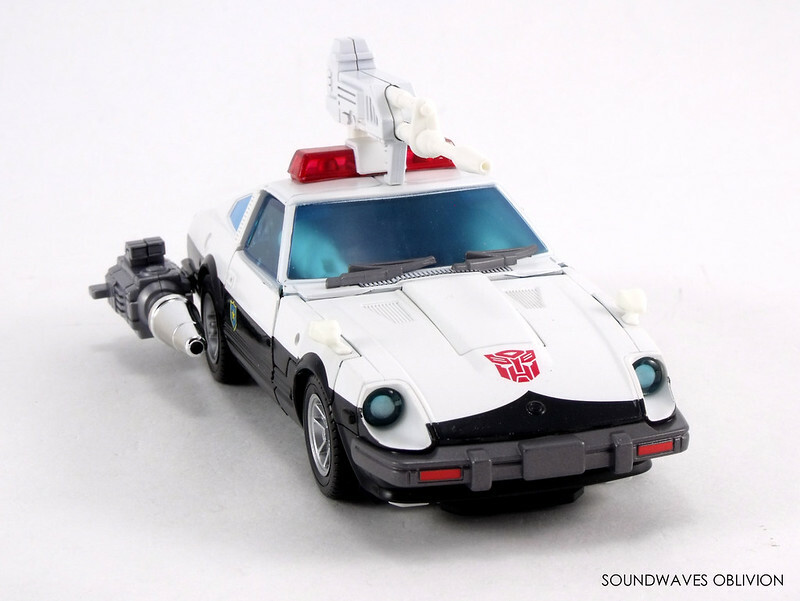 Prowl performs his duty as a police car in the animated series by driving with his warning lights flashing and sirens sounding. He led Ratchet who was carrying the injured Spike to the nearest hospital to save his life. 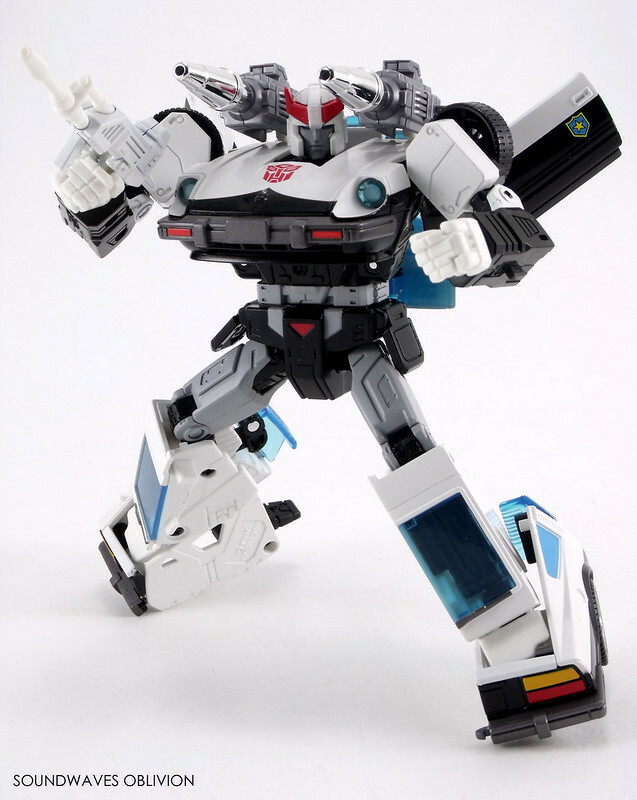 Prowl is the Cybertron Strategist who appeared as one of the main characters in the animated series of “Fight! Super Robot Lifeform Transformers”. 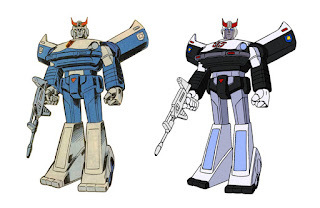 He was part of the central team of Cybertrons working alongside Ironhide and Meister to aide Commander Convoy. 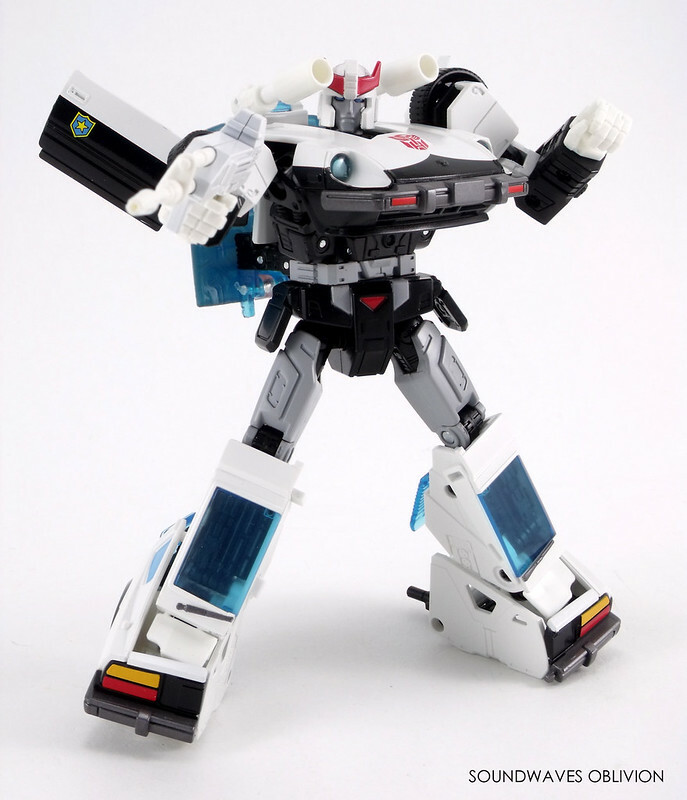 It was Prowl who suggested the idea for the Cybertrons to search for energy elsewhere in outer space before their ship became adrift over Earth. Convoys instant acceptance of Prowls ideas shows a deep rooted trust. Has a calm and quiet personality. His brain has a built-in battle computer which analyses and troubleshoots all situations. When the battle computer went down during battle, antennae extended from the side of his head allowing him to link up to the Earthling Chip Chase’s computer. 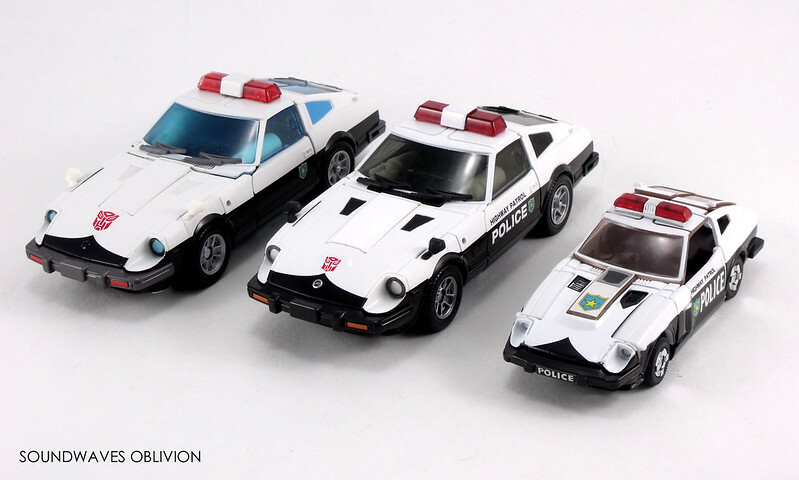 With this remote assistance, Prowl was able to aid the Cybertrons to victory. This is possibly the first example of a Transformer and human combining their resources and working together. On an unrelated note, the Cybertron’s insignia is modelled after Prowl’s face. 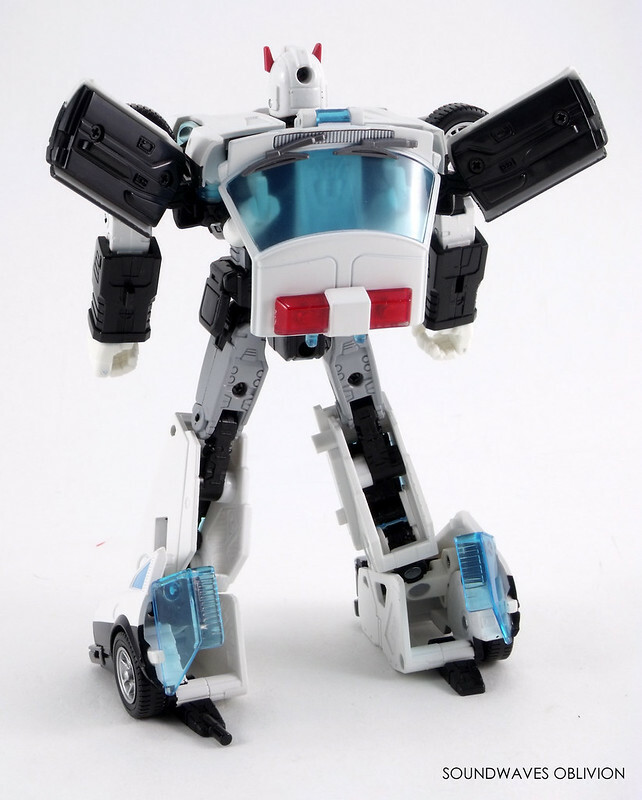 Sticking to this point it does signify how indispensable Prowl is for the Cybertrons. 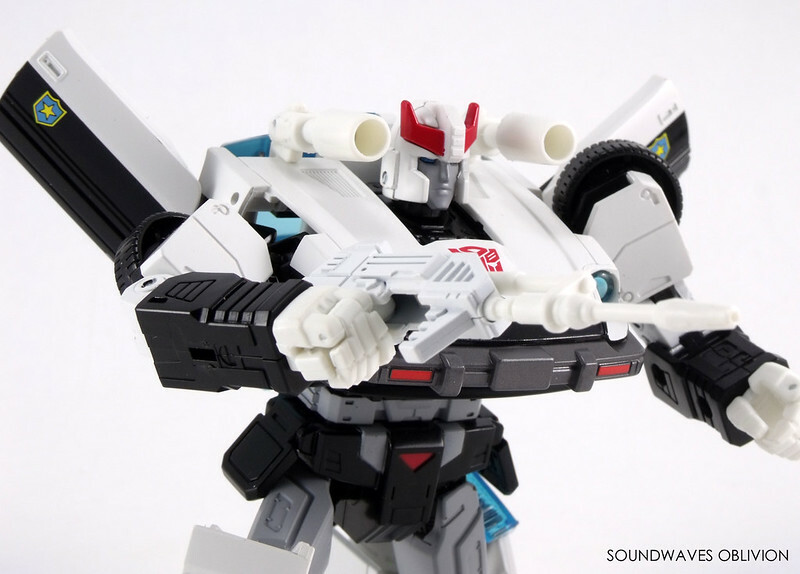 Prowl carries a high performance semi-automatic rifle capable of firing various types of missile rounds as well as laser beams. This equipment is unique to Prowl and gives him greater flexibility on the battlefield, his on board battle computer analyses the situation and he selects the appropriate setting on his rifle. His acid pellets are just one of the missile rounds in his arsenal, these contain a very strong acid which can instantly corrode metal. Enemies who have a strong outer armour have a weak interior so these pellets are aimed at the weaker joints causing the enemy’s interior to collapse. The effects are demonstrated in the unaired domestic episode “The Computer Rebellion” when Prowl repels the drones controlled by Torq 3. Cannons equipped on Prowls shoulders. They fire wire-guided missiles which cause an explosion upon impact reaching 12,000°C. The shoulder cannons were not equipped or used in the cartoon, they were however an impressive looking weapon from the original toy. Large Missile Launchers which can be attached over Prowls shoulders. 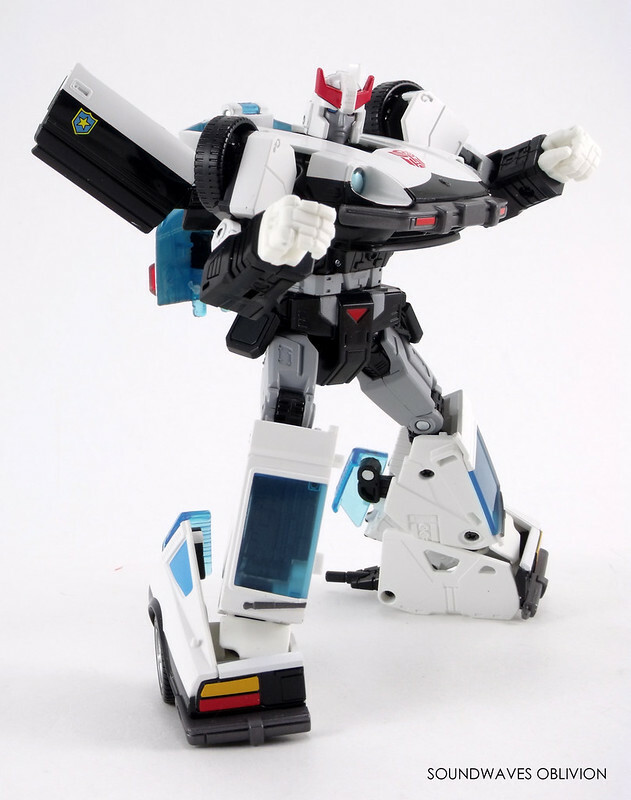 Prowl’s original toy from 1985 came with missile launchers which did not feature in the animation. These accessories pay tribute to the original toy. View the full gallery here on Flickr.